These are great for tethering my cat on the front porch. They are strong and durable and I use both sizes depending on the circumstances. When lawn treatments take place I can keep him off the grass so he is safe. Allow your cat to roam the outdoors while keeping it safely within your backyard with this cat tie out. Crafted from black poly material, this weather resistant, lightweight tie features nickel-plated swivel snaps. The tangle resistant design allows your pet to easily explore without getting snared. The bindings are not the best. My 4lb yorkie managed to break one and my 10lb cat snapped the other. I dont know if my animals are stronger than most or not but it wasnt made for them. 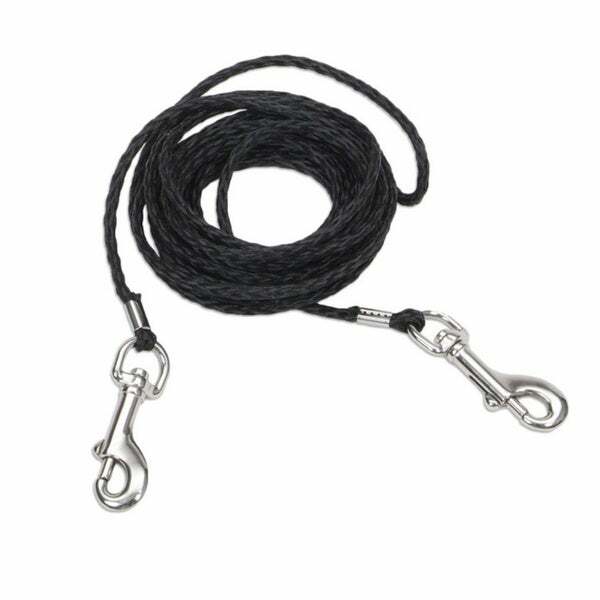 Boss Pet Products 1867613 Q241500099 Pet Tie Out Poly Rope&#44; 15 ft.